Unless given a command to jump, a dog should never be allowed to jump on humans. A dog that jumps on humans of its own free will is a dog that does not respect the person it is jumping on. Even those cute little toy dogs should not be allowed to jump on people. While you may think it is cute, it is not cute to everyone else. Not only is it annoying to most people to have someone else's dog jump on them, it can also be dangerous. A jumping dog can knock people over, muddy their clothes, put runners in nylons and scratch the skin. When a dog jumps on a human of its own free will, it is not "greeting" the human, it is asserting its dominance over the human; it is the dog communicating that it is alpha and/or wishes to own/control the human. A subordinate would never dream of running over and jumping on the alpha dog of the pack. Space is respect and lower members of the pack respect the higher members. If your dog jumps on humans, it does not respect them. 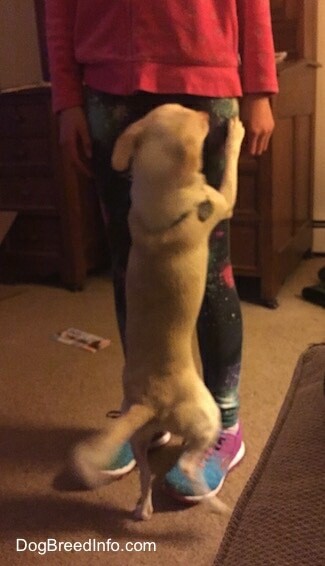 Note: when a young puppy jumps on humans it is sometimes its attempt to reach one's face. Puppies need to be taught not to jump up on humans as this behavior will manifest into other meanings as the puppy grows up into an adult dog. I remember going to a dog park where a little 4-month-old Boxer puppy ran around jumping on everyone. The dog was not heavy enough to knock most of the adults down. However, it left everyone with muddy pants and the dog was big enough to knock over small children. The owner did nothing to stop the jumping puppy. After all, it was just a small pup. Everyone around her was pretty annoyed at the muddy prints the dog was leaving all over their clothes. That is an owner who will have a problem with her dog jumping on people when it gets older. Puppies should be told from day one, "no jumping." Anything you do not wish your cute little puppy to do when it is full-grown should not be allowed when it is a puppy. Think about the behaviors you allow your puppy to do; is it something you will always allow him to do even when he is full-grown? If the answer is no, do not allow your puppy to do it from day one. Dogs like and need consistency, so if you are not allowing your dog to jump on you, everyone in the family and everyone who greets the dog must do the same. You, as an owner, must make sure this happens. It will only confuse a dog if you allow them to jump on some people who say they do not mind, and tell him not to jump on others. Once you decide you do not wish your dog to jump on people you must apply this to everyone at all times unless you give the dog a command to jump. A dog should never jump on a human of its own free will. To a dog, space and balance are very important. If you take a step backwards or lean out of a jumping dog’s way, it will continue to jump. To a dog, it is overtaking your space, which only pack leaders are allowed to do. When a dog jumps, step into the dog. Picture a sphere around you and are not going to allow anyone or anything to come into your space. When the dog jumps, step into it sideways with your body, shoulder towards the dog. Don't face the dog head-on (you may not have time to turn so don’t worry about it if this is the case). You are not trying to knock the dog down, although this may happen. Don’t be alarmed if you do knock the dog over. Although you don’t want to abuse the dog by knocking it around, this may actually go a long way toward breaking it of the jumping habit as it will create a negative experience. Dogs are incredibly physical creatures and can withstand a lot of physicality without any harm. The odds of inflicting any serious injury are miniscule. You are simply calmly filling up your space with your body, and in return, setting the dog off-balance, which is an uncomfortable feeling for a dog. Lean slightly forward, not backward. 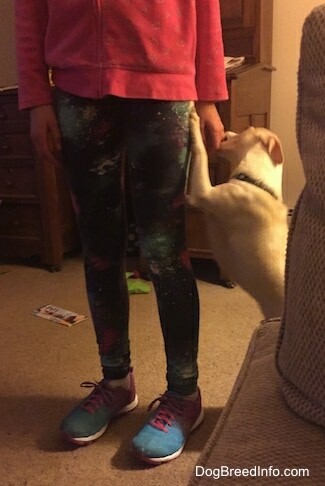 Never lean backward, as you will be giving the dog that space. Casually and calmly, keep filling your space, not allowing room for the dog to come in. Remember, your goal is not to knock the dog down, it's just to retain your space. You can do this with any dog that jumps on you; take a sideways step forward just as the dog starts to jump, filling the space the dog was about to take up. This will throw the dog off-balance and at the same time you claim your space. You will earn respect from the dog and soon, the dog will learn it is no fun to jump on you.